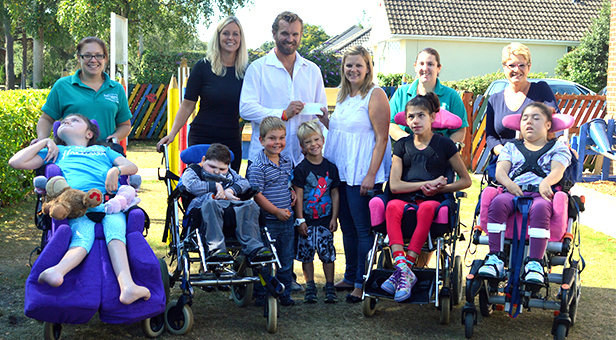 Diverse Abilities Plus, Dorset’s disability charity, has been presented with a cheque for £5,065 following the annual Grooves on the Green event that takes place in Ashley Cross. Proceeds from this year’s event raised £1,065 for the charity that supports children and adults, and their families, across the whole of the county and organisers, Jan and Richard Crump from Le Bateau, donated an additional £4,000 to Diverse Abilities Plus. The monies raised will be able to further support the work of the Children’s Team at Diverse Abilities Plus. It is enough, for example, to fund the charity’s overnight care at the charity’s children’s respite home for almost a week, one-to-one holiday activities for 50 disabled children or create a new sensory garden at Smithers. Diverse Abilities Plus was the chosen charity for the event as Jan and Richard’s son, Brandon, uses the domiciliary care service that the charity provides. Brandon has a rare form of epilepsy called Status Epilepticus in Sleep, where seizures take place which causes brain damage and he will be reliant on care for the rest of his life. For further information regarding Diverse Abilities Plus please visit www.diverseabilitiesplus.org.uk or call 01202 718266.